Despite their controversial reputation, pitbulls are a lovable and playful breed that make great companions. As pet owners ensure they're kept on a regular exercise schedule and have plenty of toys to keep them occupied. If they are cooped up inside or left alone for too long, owners run the risk of their pit bulls chewing anything and everything in sight. Since pitbulls are muscular dogs that love to chew, they need toys that will stand up to their strength and be appropriate for their size. These toys should be safe and durable, without any parts that a pit bull could break off, eat, or choke on. The tougher the toy, the better! Long-lasting solid rubber toys, treat concealing toys, thick ropes for tug of war, and chew toys are a few examples of the perfect toys for pit bulls. So, let's get started, helping you save money and time in your quest for the best pitbull toy. Here is the run-down on the recommended toys for powerful chewers. Note: Always supervise your Pitbull when he gets a new toy. GoughNuts toys are a great way to keep your energetic PitBull occupied and out of mischief. There is a reason why Pitbull pet parents return back to GoughNuts– they make resistant toys ready for some extreme playtime for longer lasting periods over other toys. This GoughNuts TuG toy is a great favorite with Pitbulls. They especially like it given it’s particular shape, rubber material and the challenge it presents in a good game of tug-of-war. The GoughNuts TuG toy is an interactive toy measuring 11” in length and 6” in width made of durable, natural rubber using engineered carbon reinforcement and a red safety indicator letting you know when it’s time to remove the toy from your dog. The TuG toy is by far the most challenging toy in the market for Pitties. Since the toy is made of rubber, it doesn’t make lot of noise when rolled on hard surfaces. There aren’t also any loose parts or pieces that can be easily broken off during playtime. It comes in colors: Black, Orange, Yellow and Green and in 3 sizes – Small, Original and Maxx. The MaXX size is the thickest measuring 6.25” in diameter and is best for dogs over 65 pounds or aggressive chewers, like the Pittbull. If you’re looking for the best toy for strong chewers that is durable and long-lasting, the GoughNuts’ TuG is the perfect extreme chew toy for pitties. The Ring Toy is another interesting and durable toy on the ever popular GoughNuts list of must-have toys for powerful chewers. Like the TuG toy it’s made of natural rubber, and has two layers with the inner core being red serving as a safety indicator so that if your dog chews down to this red layer, you know it’s time to take it away. The ring toy bounces, rolls and even floats and can be used for various games including tug-of-war and fetch. It too comes in four different colors and three sizes but the black ring with yellow dot is the MaXX and the strongest one available, and the one we recommend for Pitbulls. Supervise your pup, whenever you give him a new toy. The Ring Toy is another favorite with Pitties since it’s chew-safe and extremely strong. Also, being a hard rubber chew toy it will not cause any teeth damage. Most PitBull pet parents have tried the KONGS Extreme line of toys and have been happy with them for a short while, until they tried the GoughNuts toys – this Ring toy is a great example of an indestructible toy for power chewers and will save you $$ in the long run. 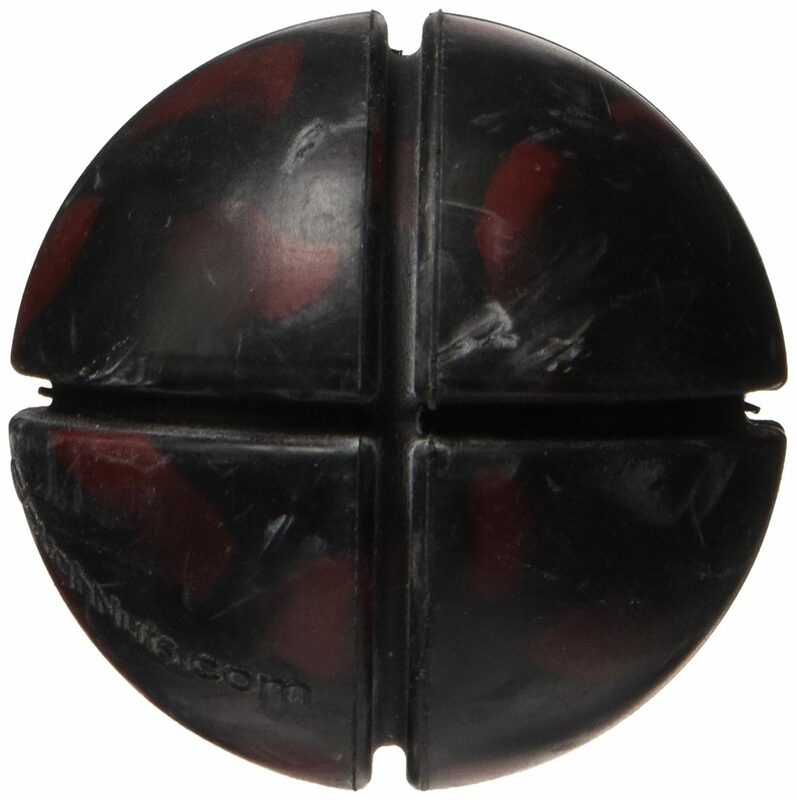 GoughNuts Black 50 Toughest Ball is a USA-made interactive chew toy designed by mechanical and polymer engineers. Goughnuts offers several other colors and pattern options for owners who want a brighter ball that is easy to find. These very bouncy rubber balls are great for large dogs who enjoy chewing and playing fetch. It even floats in water. This toy comes with a lifetime guarantee, so pitbull owners can take a chance on this toy knowing that they will get a refund if it doesn’t stand up to their pup’s chewing. 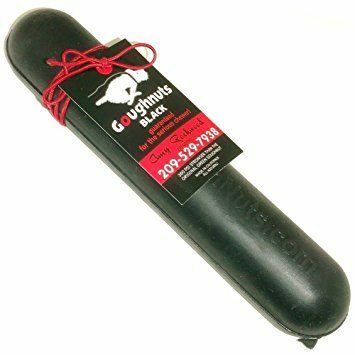 Like the GoughNuts Maxx Stick below, if an owner’s pitbull chews through the tough black outer layer to expose the red layer underneath, the company will replace it for the dog’s safety. Larger dogs love GoughNuts toys and owners are fond of the value for the price. The GoughNuts Ball is 3” in diameter, perfect for larger dogs to play with and carry around and not so small that it could present a choking hazard. With raving reviews from satisfied owners, it’s easy to see why it’s frequently listed as a best seller toy for avid chewers. Kongs is a popular and trusted brand of dog toys that are made to withstand extended play time and chewing. Kong’s large dog toys in particular are perfect for pitbulls, who are known for tearing apart most other toys with minimal effort. Kong Extreme is made in the USA. 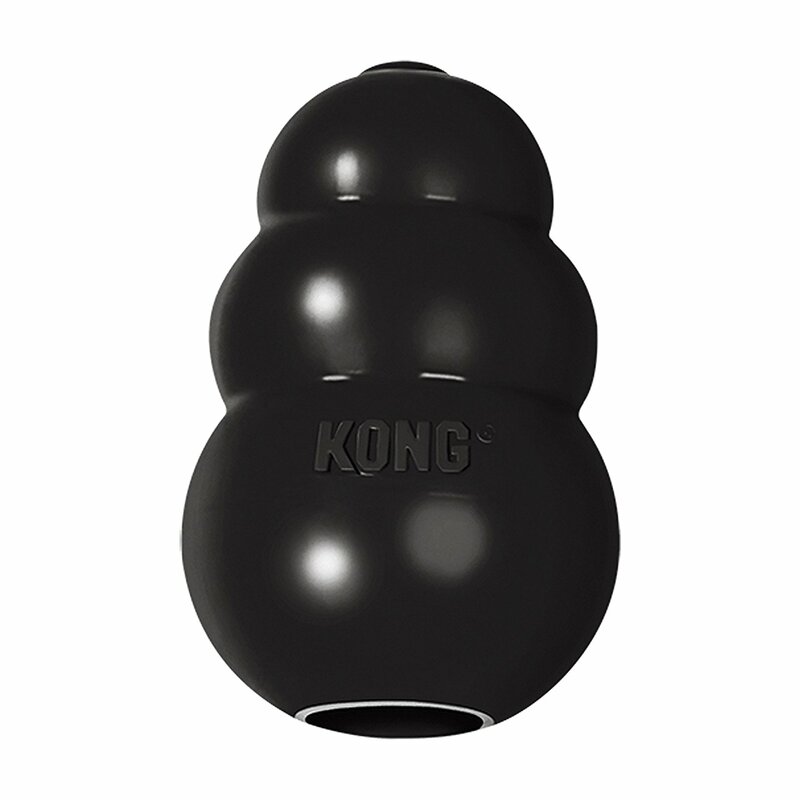 Since they are made entirely of natural rubber, Kongs are super durable and non-toxic. Their shape makes them a lot of fun for dogs to play with, too. Kong toys can be stuffed with treats to keep your pit bull occupied for hours and are easy to clean afterwards, an ideal combination that means happy dogs and owners too. Treat dispensing toys help keep dogs entertained for quite a while and can be used to reduce separation anxiety when their owners are away. This large Kong is a great value option that is perfect for strong dogs who love to chew. Stuff it with kibble, peanut butter, frozen yogurt, raw veggies, and other treats that your pupster loves. Compared to most other dog toys, Kong Extreme lasts longer with big strong dogs like pitbulls. With stellar ratings on Amazon, the KONG is still one of the best dog toys for aggressive chewers like the pit bull! GoughNuts MAXX 50 Stick is an indestructible, safe chew stick toy made in the USA designed for extreme chewers like Pitties. These long-lasting, large Maxx Sticks are 9 inches long and 2 inches in diameter, sort of like a big sausage. Each stick weighs approximately one and a half pounds, so they are easy toys for pitpulls to fetch and play with. They even float so they can be used for fun in the water too! GoughNuts offers customers a lifetime warranty on its Maxx Sticks. It also features a safety indicator where Black/Green means "GoughNuts" and Red means "Stop". So if your pit bull manages to chew through the outer layer and expose the red layer underneath, you should discard the toy. It is a reasonably priced toy for the extreme chewers and is a toy that pitbull owners can buy that will last longer than most other so called ‘indestructible’ toys on the market with safety being their #1 priority. The diameter of this toy is designed to make it harder for aggressive chewers to tear it shreds, while still being easy to catch in their mouths. Customers have tested this product on pit bulls who love to chew and found that the Maxx 50 Stick lasts months with minimal damage. West Paw’s Tux are yet another great choice of durable toys that owners can stuff treats into to keep their dogs busy, engaged and challenged for hours! These toys come in aqua blue, tangerine orange, granny smith green, and black. Tux dog toys bounce, fling, and even float on water. Dogs love Tux toys for both solitary chewing sessions and interactive play time with their owners. West Paw’s toys are USA-made without any toxic ingredients like BPA or Phthalate that could potentially harm dogs. Plus, these toys are dishwasher safe making them easier for owners to clean. West Paw toys are 100% guaranteed against dog damage, so if a pit bull manages to damage this toy, owners can return it to the company for a full refund. Owners love Tux toys because they are extremely tough and are great for keeping dogs preoccupied. The hollow middle is big and makes it easy for owners to insert treats like kibble, raw vegetables, frozen yogurt, peanut butter, and more. Toys like West Paw's Zogoflex are great for fighting dog boredom and for curbing destructive chewing behaviors in both puppies and adult dogs. If you are looking for yet another example of the best toys for pit bulls, Nylabone is a trusted dog chew toy maker that has been around since 1955 that won't let you down. Their XL Dura Chew Textured Dog Chew, is a great chew toy option for pitbulls, an exceptionally strong breed of dogs that simply love to chew! Nylabone is long lasting with specially designed textured nubs and ridges that help keep dogs’ teeth clean while they chew. This USA-made chew is best for dogs who are over 50 lbs. 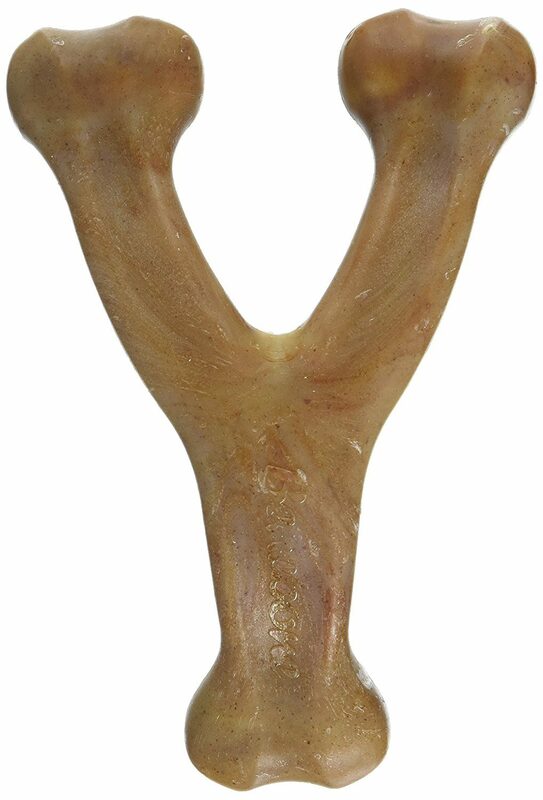 Nylabones have flavor throughout the whole bone (not just the top layer) so that dogs don’t lose interest in chewing. Nylabone chews come in other flavors too, like peanut butter, liver, chicken, and bacon. Owners love Nylabone chews because their dogs consistently return to them and they can last weeks or months depending on the dog’s chewing style. Nylabone believes that destructive chewing is the one of the most preventable negative behaviors that dogs pick up. These toys are veterinarian recommended to curb these behavior as well as deal with attention seeking, boredom, and more. Buying chew toys for pitbulls is a key way to discourage destructive chewing and give them a healthy outlet for their instinct to chew and Nylabone is certainly ranked as among the best dog bones for aggressive chewers out there! Another very good toy for pit bulls are the Kong Extreme ball toys which are made of durable, puncture proof rubber and is ideal for larger dogs and avid chewers. It's easy to see why it is ranked among the best indestructible dog toys currently available. Perfect for playing fetch, these bouncy balls are recommended by vets worldwide for medium and large breed dogs. Kong Extreme weighs about 260 grams and is 3” around. Owners love this toy for pitbulls because it can withstand quite a bit, even with dogs that destroy every other toy in a matter of minutes. After months of chewing and playing, owners are happy to see that this toy survives with minimal damage or teeth marks making this an excellent pitbull proof toy. 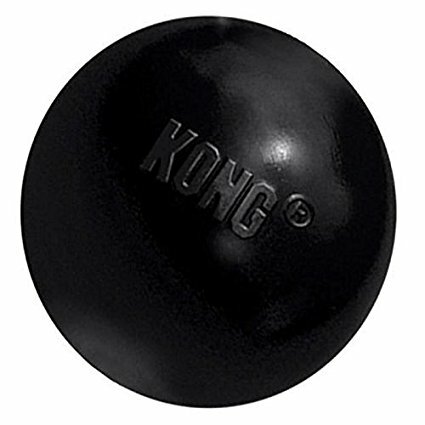 Like most Kong toys, this ball also has a small hole in it that can be used to insert or freeze treats for even more fun! Owners can place small bones, kibble, peanut butter, or frozen yogurt into the hole for dogs to find. Since Kong's extreme toy dog ball is made completely of natural rubber, it is non-toxic and easy to wash too. Another tough dog toy for pitbulls puppies and adults is the Mammoth Flossy rope tog toy which comes in several different sizes. The ideal length for adult pitbulls is the medium-length Flossy, which is 20 inches long. Mammoth dog toys are made using premium color cotton blend rope fibers that floss dogs’ teeth while they chew and play. Talk about a win-win situation. This toy has three knots along its length that make it easy for owners to play tug of war with their dogs or for dogs to chew and play with on their own. Unlike other toys, Mammoth toys don’t have any pieces that can be broken off and rarely leaves frayed ends all over the house like other rope toys. Owners like Mammoth tug toys because their dogs love to play with it and carry it around with them. This toy helps keep dogs’ teeth clean and their breath smelling fresh, perfect for maintaining their dental hygiene with minimal effort. This is one of the best toys for pitbulls as the Mammoth Rope Tug is made longer than other rope toys and stands up to most dogs’ chewing. Benebone is a growing brand of dog chew toys that are meant to be chewed but not eaten. They offer a bacon-flavored chew toy that is wishbone shaped and made using only two ingredients: super strong nylon that will last even with the strongest of chewers, and bacon. This great pitbull chew toys is also offered in other flavors like chicken and peanut butter. 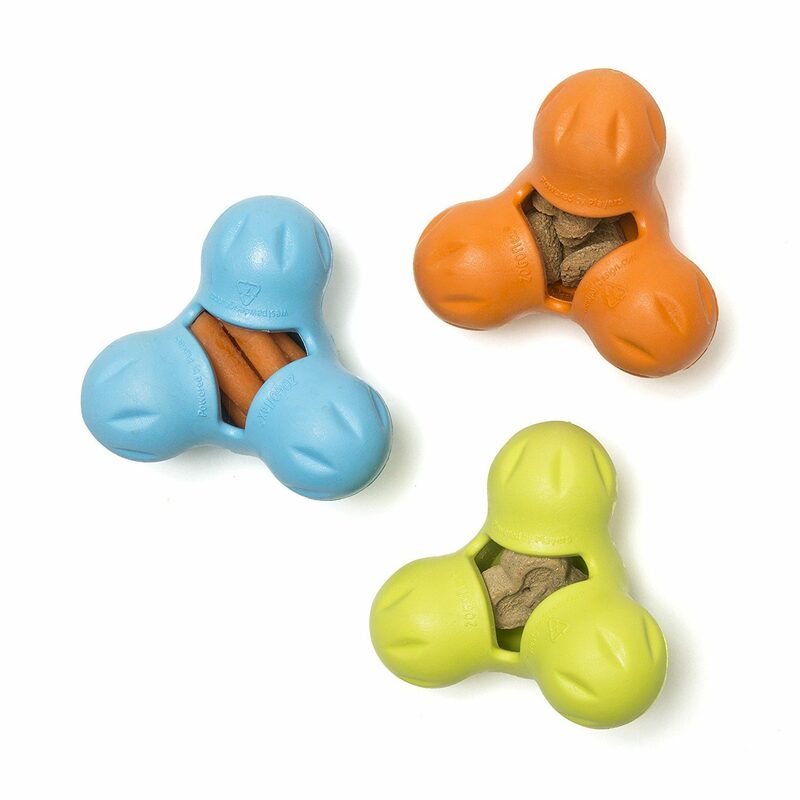 This toy’s wishbone shape is ideal because it makes it easy for dogs to hold while they chew. Benebone chews are larger and last longer than other chew toys available on the market, and the price is great too. Owners love this brand of chews for pit bulls because Benebone’s toys are free of chemicals and artificial flavors, so their dogs can chew to their heart’s content without any worries. Like most dog toys, owners should supervise their dogs while they chew on this flavored Benebone Wishbone and throw it out when it gets too small or pieces start to break off. Avoid giving a pit bull soft toys with beady eyes, squeakers, and bells that can be swallowed or choked on. If you do decide to let your pitbull play with soft toys, they should always be supervised. Chances are that a pitbull will rip apart this type of toy very quickly, so not only is it potentially dangerous but also a waste of money. The same goes for letting a pitbull play with typical sporting balls, like tennis, basketball and soccer balls since they are not puncture-proof or made for chewing. These toys can easily be ripped apart by a pitbull who will quickly lose interest in them. These types of dog toys can also pose a hazard if small pieces are ingested or they are made with toxic materials that are not meant to be chewed. Bottom line, the care you take when it comes to the foods you feed your Pitbull should be applied to the types of toys s/he plays with. Yes it can sometimes be challenging to keep Pitties engaged and well exercised. Pitbull owners know the struggle of buying toy after toy, only to have their dogs chew it to shreds in a matter of hours, or even minutes! And we all know, that when left to their own “devices“, a Pittie will come up with many ingenious ways to cause great property damage and create his own entertainment. Not only is this hard on the bank, it can also be dangerous to give dogs toys that they can easily break and potentially choke on. Investing in durable and chew-proof dog toys specifically designed for aggressive chewers will make everyone happier, as well as save us some frustration, worry, and $$! Above we've listed 2018's & 2019 bestsellers of some of the best power chewer dog toys that Pitties will definitely enjoy and keep them out of trouble. TIP: An excellent idea is to rotate your best pit bull dog chew toys around so that they won't tire of them. We recommend to cycle through different ones, each day of the week. Your pup's interest is stimulated by the arrival of a new dog toy or possibly one they have not seen for several weeks. Thank you for reading and we hope you have found the information useful. What are your own experiences with chew dog toys and tips for keeping Pitbulls entertained? Share your tips below and please don’t forget to share with us if you found this content useful! I bought a kong stick it was purple it lasted about two days our blue nose put chewed it in half haven’t found a toy yet she doesn’t destroy? Any suggestions would be appreciated..
Have you tried the GoughNut MaxX TuG ring or the GoughNuts Original, as other owners have found these to be some of the toughest toys on the market and are backed up by a lifetime guarantee. If you do decide to try them let us know how your Blue Nose Pitbull got on. We have 3 pitbulls and our youngest is 1 years old. He has gone thru 2 Goughnuts Maxx Chewsticks in 4 months and tore off each end revealing the red rubber underneath. He has also gone thru 3 Extreme Kong woblers. The only thing he has not destroyed so far are the MaxX TuG ring and the original GoughNut black dog chew that looks like a big, fat doughnut. We continue to buy GoughNut products as they have lasted the longest. I don’t ever send them back since it would cost about the same to mail them back and get them replaces even with the lifetime warranty than if I just bought a brand new one from Amazon. But at least I don’t have anything else in our house chewed up. My pitties love all their GoughNut toys and will not play with anything else, especially my youngest one who is still teething badly. My puppy is 85 lbs, and my oldest is also 85 lbs. We have a run pittie that is 65 lbs. Thanks for your great suggestions and feedback Loida. We agree that the GoughNuts range of products are among the toughest chew-safe toys on the market. I am glad that the GoughNut Doughnut and MaXX TuG ring are working great for your Pitties. We particularly like the safety indicator feature they incorporate on all their toys. 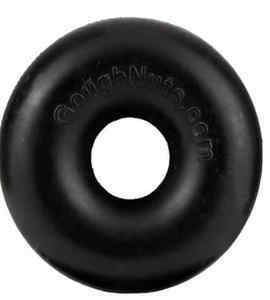 If your pet does indeed manage to chew through it and exposes the red rubber, GoughNuts will replace your toy. In addition, what I would also say is that the manufacturers are always interested in understanding how the wear and tear has occurred on the toy, as this contains vital information for future development and for continuous improvement for making sturdier, more durable toys for our furkids. I know it can be a bit of a hassle, but it really does help…..